The San Francisco Recreation and Park Department rents out the soccer field at Mission Playground on Tuesday and Thursday evenings. 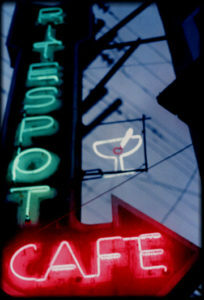 Photo by Alejandro Bryan Rosas. Update When an argument breaks out in October, 2014 between newcomers and longtime players, Park and Rec explains its policy. Mission Playground formally reopened to ceremony and community love two Saturdays ago, but one San Francisco Recreation and Park Department policy is drawing criticism: allowing individuals to rent out the park’s public soccer field on Tuesday and Thursday evenings. Since its renovation, Mission Playground has become “as beautiful of a small urban park as I could imagine,” said Phil Ginsburg, the parks department’s general manager, at the reopening ceremony. Where asphalt once stood is now a green soccer field with synthetic turf. The park formally reopened after glowing speeches by Ginsburg and Supervisor Scott Wiener, who both stressed the importance of parks and green spaces for community well-being. But some say that promises of community inclusion are honored more in words than action. A group of mainly Spanish-speaking soccer players who have assembled at the park since before its restoration can’t play there for free on Tuesday evenings when the parks department rents the field to San Francisco Pickup Soccer, an organization that charges players between $5 and $10 per person to play in a game. 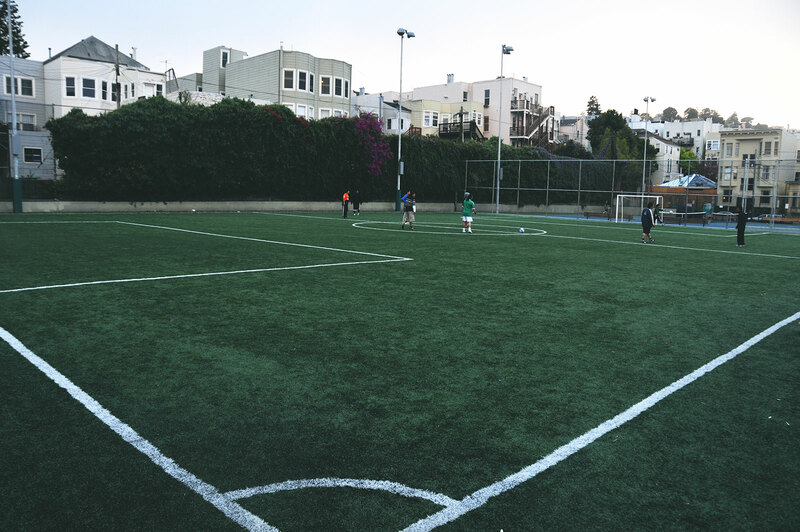 “SF Pickup Soccer is an organizer which has contracted with us to utilize the site on Tuesdays from 7 to 9 p.m. to encourage the community to get involved and play soccer,” says Connie Chan, deputy policy director for the parks department. SF Pickup Soccer uses a mobile app to let users sign up in advance to play soccer on available fields. “It is an experiment with new mobile app technology,” says Chan. “People played hard,” says Jaime Elias, a 32-year-old civil engineer and Mission Playground fanatic who has a petition going to end the practice of renting out the soccer field. Teams typically played almost every night of the week. Back when Elias began playing soccer at Mission Playground, the area around Valencia and 19th streets was still “divided in colors.” The area was Sureño turf, and dangerous. Before the restoration, soccer at Mission Playground followed a system: seven versus seven. If you came without a team, you found one at the field. Winners kept playing until the end of the night, and losers had to exit. “For some of these guys, their whole family’s in Mexico,” says Elias. He suggests that for many players, soccer with friends is their main emotional and social support. When Elias first came to San Francisco, he was amazed at the quality of the sport. “I was like, ‘Wow!’ This is like New York street basketball,” he recalls. Back then at Mission Playground, the soccer area was a field in name only. The ground was asphalt. If a player fell, he would hurt himself badly. Elias says people came out anyway, in part because there wasn’t an abundance of green soccer fields in San Francisco, and in part because Mission Playground is where the best players were. When the park reopened some three months ago, Elias says there was more interest in it because “They made it beautiful.” And that’s when people began to exercise their right to rent out the soccer field on Tuesday and Thursday evenings. A few weeks ago, Elias says, he came out to play soccer on a Tuesday night and saw a man with an iPad signing people up to use the field. Elias thought the man was charging commission for use of the field, but he was actually a representative from SF Pickup Soccer. When the man asked Elias to pay $7, he left the field, frustrated and confused. Chan says that on Monday, Wednesday and Friday evenings, the soccer field has open play hours from 6:30 to 10 p.m. On Thursday nights, when the field is also available for hourly rental, often no request is submitted. And although Elias’s petition has garnered 50 signatures, he admits he’s not extremely optimistic that District 8 Supervisor Scott Wiener will respond positively to it, and that other projects have taken priority in his life. Wiener says that he hasn’t received Elias’s petition. When asked for comment, Wiener said, “I think that Rec and Park has struck a good balance” between open play hours and renting the field. “My understanding is that for a good part of the week the soccer field just has open play,” he said. On Tuesdays, when SF Pickup Soccer rents the space and charges people to join teams, Elias says his friends typically do what he did: leave. They opt to go to Jose Coronado Playground, at 21st and Folsom, which Elias describes as “malísima,” or terrible. Jose Coronado Playground resembles the old, unimproved Mission Playground in some ways. But Elias says his friends have few options now except to move their game there. “These guys can’t afford to pay to play soccer,” he says. The privitization of our public spaces continues under Ginsburg’s Rec and Park. The trend of the city (even the Mission) towards only for the rich and by the rich will march on unless we return to the concept of public space for all the public not just app-wielding techie gentrifiers. So are you against all organized leagues in city parks? That seems extreme. It is a great way to get people to be involved and active in the parks and in the city. It is a great way for people to get regular exercise and to engage with fellow city residents. A group of 20 people renting a field for 60-120 minutes is hardly the privatization of our public spaces. A great way to “get involved” is to go out and participate, not wait until your iphone tells you you can go play a game. Be a social human being for crying out loud and go ask to play a pickup game. Nobody’s iPhone is telling them to do anything. The organizer of SFPUS uses meetup.com as a way to keep our group organized. Meetup.com is a free website that anyone can create a group for or find groups to join of people with common interests. As mentioned elsewhere in the thread, this is our way of staying organized and getting fair playing time. Just showing up at a field can be a complete waste of time when either it’s overcrowded, or nobody is there at all. It’s not that we’re being anti-social. It’s actually the exact opposite. We just trying to maximize our free time. Everyone works so much nowadays, is that such a bad thing? So, we are using some free tools on the internet to help be a little bit more efficient. Just because they’ve played here for years doesn’t mean they should be able to monopolize the field 24/7. We’re talking about 4 hours per week out of 280 hours that it’s pay to play. No offense Marco, but there are only 168 hours in the week. Users of the field can determine for themselves how to share it. The City shouldn’t subcontract out public fields to private companies, that then make a profit and exclude people who don’t have a mobile app or who can’t afford to pay to play. Eddie… maybe in Marco’s world there are 380 hours in a week! But you are right on the money about the city making more money off the backs of it’s citizens! It is shocking to me that people are taking this article so seriously. The tone is from such a victim, “oh woe is me”, place. Talking about how they are away from their families. My family lives in Canada, and I am away from them too. And you know what, we ALL choose to be HERE. And then the last two paragraphs. Come on! Is this really how the Mexican locals want to be characterized, as poor lowly victims. I have meet the guys who play on this field, and that is NOT who they are. This is a few whiners, who are bitter about something in their life, and they are projecting it on others. This is NOT about the “rich” taking over the field. This is about locals reserving the field, so that they can also create a community and have a consistent weekly game. This is EXACTLY why the field is there. To serve local soccer enthusiasts. The park improvements were very expensive, not to mention the continuing costs to maintain it. Charging players a few days out of the week is very reasonable. Only for those who could afford it! Why not make some money a few hours a week to help keep the park up and running the rest of the time. Look around at the state of some of the facilities at other parks, if improving them meant renting the facilities for a very modest sum a few hours a week, I’m for that. I think we have to be amenable to alternative ways to raise money for our parks. Public parks should remain public parks. Just because some yuppies on smart-phones want to shake the flab from their computer-programmer bellies doesn’t make this okay. It’s simply a testament to how yet another unofficial institution of real, working-class people in the Mission has been ruined by a bunch of spoiled white people with iPads. Dude, I don’t even know where to begin with this comment. Incredibly ignorant and tremendously racist. SF Pick Up Soccer that rents the space is made up of people of all races and income earners, and last I checked they didn’t just sell iPads to “spoiled white people”. Please do you best to part of the solution, instead of adding to the problem. How does SF justify taking away public recreational opportunities from any group? What a load of b.s. it is when Ginsburg talks about childhood obesity and the need for recreation facilities if what he really means is that the poor can’t play and he’s only worried about the rich kids getting fat. Another good reason to Vote NO on Prop. B. The crooks that run Rec and Park can’t manage what they’ve got and pander to the 1%. Before the renovation, Mission Playground was a garbage dump. Just a small group was using it. It’s nice to finally see it cleaned up & familiies actually using it. Most parks / rec centers do charge a fee to use the the playing fields. Ask any parent whose children were in school sports & their school did not have a playing field. The fees charged are used to maintain the parks & keep it a good place for everyone. Hopefully, if all goes well, Coronado Playground will also be renovated, & not continue to be a dumping ground. Now its only for upper middle class folks with money. You are demonizing and characterizing a group of people you know nothing about. Have you ever played in a game? Have you ever come by on a tuesday night to see the diverse group of people who come out, which by the way includes teachers and persons who work for non-profits. I’m all for a debate on civic activity, but these comments add nothing to the discussion. I stand by my remark. Never mentioned race. Nobody accused you of mentioning race, but you did generalize our whole group of players as upper middle class with money. I would be real careful about generalizing any group, especially ones you know nothing about, with unfounded claims as this. It certainly doesn’t help your argument. What you say about fees at other parks and rec centers may be true, but in this case, the fees are going into the pockets of the owners of SF Pickup Soccer. Public parks are for the public, not for profiteers. In any case where there is a league fee, that money goes into the pocket of the organizer. This is no different than any other league or any other field in the city and is well within the Rec & Parks guidelines for permitting and use. Leagues are non-profit organizations. SF Pickup Soccer is a for-profit commercial venture. I appreciate that the city must balance the need between permitted use and open play on city soccer fields. At Mission Playground, they have reallocated free open play time from the community at large to commercial ventures with a pay to play model. Not strictly privatization, but certainly commercialization. It’s true that some, but not all, leagues in the city are not-for-profit. Sports4Good comes to mind. Let’s be careful about the definition of not-for-profit. It does not mean by any stretch that those organizations do not charge fees above their own external costs. Also, individuals can financially benefit within a not-for-profit entity meaning that not everyone involved does so on a volunteer basis. Not for Profits also are able to build up an excess cash surplus, to use for further future expenses, such as equipment expenses. Generally the same type of costs SFPUS faces. OK, this issue is pretty important to me, so putting all my thoughts for those who care. I even added section headers. I have been playing pick up soccer regularly on this field for 3 years now, and feel that I should comment as someone who is part of the Mission’s gentrification (am a white tech worker) but who has gotten to know the regulars here and connects with their perspective. The net result? Overpaying groups of white people taking the field from the latinos who have used this community space for decades. The permitted play is allowing SF Pick Up Soccer to put a premium on what used to be free play, making up to 400% profit or more. The permits are $35 per hour (I believe – the permitting process is opaque), but SFPUS usually charges around around 21 players $7 to join for an hour. Profit for them would thus be around 400%. That’s right – your local parks, which you have already paid for, are now being sold back to you at a premium. Meanwhile, you don’t need to be a sociologist to see the institutional racism progressing. I was there the first time the regular pick up games (which had a crowd of up to 50 people on warm Tuesdays) got pushed off by a permitted group. There were guys, mostly latinos, who have been playing there daily for 20 years, who use this as a community space, who never requested the turf upgrade, and whose community the government promised that the new rules would respect, now sitting on the sidelines while a bunch of paying tech workers took to the field. They stared, they sighed, and they went home. A lot of gentrification is invisible; this was the first time I saw it live, bottled up into one moment, and written on the sad expressions of the people who just got disenfranchised. I asked a few guys how they felt about this; they just shook their heads. This article paints a pretty biased picture of “how it was before” – some sort of dangerous gang game where people got hurt all the time falling on concrete. That might have been the case a decade ago (I don’t know), but it definitely hasn’t been like that since I started. Accessible? Yes, it can be intimidating for an “outsider” to join an all spanish / mostly latino pick up game. But that is a fear that people impose on themselves. Anyone, no matter their race or background, has always been welcome out there. Everyone is given a chance to play, and treated with respect. I have seen foreigners, whites, blacks, asians, latinos, guys, girls, everyone come play, and it’s been fine. The only people who had a bad time were those that made up their own fear, “I am not welcome here because I am not latino,” and thus didn’t talk to anyone, didn’t approach the game with confidence, didn’t bother to say “hey guys I’m next”. Fights? In three years of regular play, I’ve seen one fight, which was a brief typical sports argument. The two guys involved were back out playing the next day. When I play on fields in the marina, there are fights practically every day. Latinos take a long term view to pick up soccer – if you’re going to be there every day, why make enemies or get hurt? Of all the places I’ve played soccer in the city, I have always felt like this pick up game was safer and more respectful than anywhere else. Caveat – the playground between the field and Valencia street WAS dangerous, but not because of the soccer players. Homeless people and drug dealers would hang out and sleep there. Now it’s an awesome children’s playground, and is better for everyone. This is one of the few places where the incoming, newly wealthy community can interact with the local latino community and find common ground. Pick up soccer is a global activity where people connect and have fun together. Scott Weiner and SF Pick Up Soccer have now taken two of five weeknights from this community, all in the name of money. It’s sad, and reflective of what’s happening all over the Mission. If you care, I encourage you to stand up for the open pick up soccer on this field. I second that. Thanks Loren. I second Loren’s comments. Its been great to play free pickup games here, and charging to play on this field is BS. If people want to play, they just have to show up. No need to kick anyone off the field, just join the game. There are plenty of other good fields around the city that can be rented. Why screw up the one regular pickup game in the area on a decent field? I’d even be okay if they rented out the field at cost (it would be about $1-$2 a person), but charging $7 per person for less than 20 minutes of playing time is outrageous. Well put. It is unfortunate but the Recreation & Parks Dept. manager and the Rec Park Commission have adopted a “revenue-first” policy, and officially view our parks system as real estate, from which value (ie money) is to be extracted. Also unfortunate is the fact that Supervisor Wiener is dedicated to supporting this official policy of fees, rentals of public space to private individuals and and companies and privatizing control and responsibility for parklands and facilities. I urge folks to vote NO on Prop. B, the huge parks bond which will give $160 million to this same management and reinforce the same policies of privatizing public property. Revenue first implies that the city sells permits for the field more than it’s available for public use. Couldn’t be further from the truth. Also permitting areas of park areas is a long standing practice in any municipality. Misleading post. 3) Your profit calculations assume 21 players showing up every session. That’s not always the case. If nobody shows up due to rain/cold weather/holidays etc. SF pickup is at loss, since they are paying for permit/insurance anyway. Thanks for the clarifications, Alex. I would edit my original post but that doesn’t seem possible; anyway I’ll let the points continue to stand with the caveat that my revenue estimates come with a huge grain of salt. I’ve been playing with SF Pickup for more than a few months now and there’s a lot of misinformation posted in this thread as well as in the article. First of all, the generalization of users being tech primarily workers with loads of cash to burn and “the 1%” is as laughable as anything I’ve seen. Just for some perspective, the 1% based on income is roughly $717,000 annually or $8,400,000 based on net worth. While I haven’t polled everyone at the field, I’m going to go out on a limb and say that 0 of us qualify for that group. There appears to be a new offshoot branch of Godwin’s Law that says when something costs money, those who pay are in “the 1%”. The players at SF Pickup come from all walks of life. Nobody is discriminated against, nor should they be, just because of their job, skin color, or country of birth. I’ve played with regular players in this group from Tunisia, Morocco, Nigeria, Ireland, Ukraine, Brazil, England, France, China, South Korea, and plenty of other places. The generalized comments in here are pretty disgusting and apply the same level of discrimination that they claim to be attempting to prevent. I’ve never seen anyone with an iPad at the field, nor is a smartphone or mobile app required to sign up. Anyone with access to a computer with a web browser can do so. It’s not a special app that only we have. It’s a fairly popular website called Meetup.com. A smartphone is used by the organizer at the field with a Square card reader to collect payments. We use the field for 2 hours per week. Period. It’s a nonstarter. Every other field in the city operated by Parks & Rec requires a permit to reserve, too. Crocker Amazon, Franklin Square, and others all require a city permit for use. There is so much available open playing time even at this field, not counting all the other local pitches, that I’m struggling to understand why a petition is needed to remove us from the grounds. You wouldn’t join a league for free, either, but SF Pickup doesn’t come with the commitment to be there every time, so I don’t mind paying for the few times I get to play. There are some costs the organizer takes on we cover with our fees as well. Balls can be lost. Sometimes we use small goals which break and need to be replaced from time to time. There are pinnies provided and worn by the teams which are taken home and washed. Also as mentioned in above comments, as many as 50 people can sit around to wait their turn for pick-up during open play. The field permit guarantees us that we can cap the number of players so we can all get a fair amount of playing time. It’s definitely more than the “20 minutes” somebody misinformed about above. I understand that soccer is culturally important in the Mission, but that doesn’t mean it’s any less important to those of us who play there for only two hours each week nor is this is by any means the only place in the Mission to play. We’re not an exclusive club and anyone can join. I really enjoy meeting new people who come out and play with us. I hope some of you reading this put your negative feelings aside and play with us some time. I think you’d have fun, but if you don’t want to pay then no offense taken. You can play any of the 166 other hours we’re not there. Maybe users don’t need your mobile app, but they do need a computer, a credit card, and the discretionary funds to pay a for-profit company to play pick-up (not league) soccer on a public field. I don’t understand how you can describe opposition to the privitization of our public spaces and the gentrification of our neighborhood as “disgusting” and “discriminatory”. Your failure to understand that not everyone can join your group because of economic and technological reasons reflects the insidiousness of privitization and the ignorance of the new well-heeled residents (from whatever percent) towards the working class and poor communities that they are displacing. Thank you to Loren Baxter for his above comments. Uh. Calling two hours a week “privatization of our public spaces” is a bit of an overreaction, no? If I’m reading this correctly, SF Pickup Soccer is trying to give people a chance to play soccer without joining a league, or sitting on a bench for the entire night at open pick-up. Are you opposed to permitting of parks in general? Because most permit holder discriminate, i.e. company parties require you work at the company, leagues require you pay to join them, and so on. You’re not explaining how this is different. The SF Public Library offers free computer and internet access to all residents of the city. ATM debit cards work just as well as a credit card, and in absence of that, there’s always someone in our group willing to take cash and put the player’s fee on his own card. Permitting and privatization are totally separate issues. Any time you see a league match happening, that space has been permitted. Even barbecue spots in Golden Gate Park are permitted. It just gives a right of reservation of the space. This has nothing to do with privatization, which involves the transfer of ownership from public to private. We don’t own anything we’re just renting it from the city. Right before we play, little kids have soccer practice and they have a permit too. SF Park & Rec has issued a permit to us to use the field as it is their policy to do so and our use of the field is not violating any rules or laws. The reason I say that this is disgusting and discriminatory is that we are not the only group that operates a pay-to-play pickup, but we are being picked on based on some misguided feelings of entitlement. Check out soccerfours.com which operates at Kimbell and Franklin fields (with permits). We are operating well within the rules of the city, so to start a petition against us directly certainly makes us feel unwelcome when we haven’t done wrong on anyone else. There is no class war going on here other than the one in your mind. We just want to get out there and play. Thanks, Eddie. I totally agree. I coach a U-11 team and at multiple times throughout our season, I have to show our permit to get pick-up games off our practice field. If San Francisco wants to get rid of permitting for use of facilities, then they should do it across the board and see how the city enjoys it. Thank you for engaging in the discussion! I understand that the people playing in SFPUS are really enjoying having the field, as it sounds like you are. I have a few responses to your comments. And before, you had an equal opportunity to play soccer with everyone else and to make friends with a variety of people. YOU can play every single day of the week, for free! With people from all over the world. Isn’t that cool? Now, if you can justify paying $7 every time you want to play, you have an unfair advantage over those who can’t. Entitlement doesn’t concern you? Let me restate that: There are “166 hours” every week where ANYONE can play soccer, including you! And there are now 2 hours where those with cash can play. This argument is ridiculous and this 168 hours number is silly. People work during the day. And nobody plays soccer at 2 in the morning. Pick up soccer has a specific time: After work, from 6:30 to dark (say, 9:00). It is not organized, so people can’t just “have a game on Sunday at 11:30am!”. You show up at the regular time because you know that is when pick up soccer is on. You don’t need to call anybody, or check a website, or have some mailing list where times are organized. You don’t need to figure out which of the SF fields everyone will be at. The lifeblood of a pick up game is that it is at a specific time, on specific days, on a specific field; that you can count on showing up and there being enough people for a game. You just show up, even on a whim, and this is one of the great joys of pick up soccer. Have you ever tried to go to a pick up game at a random field, driven or bussed all the way over there with your gear, only to see that the field is empty? You’ve just wasted time and it’s sad. It doesn’t work that way. Specific fields, days, times. So, 5 days times 2.5 hours = 10 hours a week at mission playground. That is when pick up soccer is played, and 20% is going to SFPSU with another 20% available to the next group who starts reserving Thursdays. 40%. Yes, there are some weekend games, but weeknights are special, the “regular” nights, the most consistent ones. 40% of weekday pickup games gone. Nobody is discriminated against by race or gender. But they are discriminated against by cashflow, and their willingness to participate in an online community (meetup.com) rather than the real one that they formed right here on mission playground. Please don’t forget that. This used to be a free space; now it is one where exclusivity is used to generate profits. I know I sound a little angry (because I am), but this is not directed at any of the players of SFPUS. They are surely good people who just want to have some fun. But it’s really important to highlight the problems with the new rules and recognize that a great community is being wrecked. I encourage YOU to come play a regular pick up game (free! ), get to know some fascinating people from all over the globe, and truly see what is being lost (well, taken) from this place. Your assumption is that everybody works 9-5. My guess would be that for the demographic on the field this may not necessarily be true. Somebody (either via taxes, or permits) has to pay for the construction and maintenance of these fields. The issue here is with SF parks and recreation. SFPSG operates within their rules and is being singled out, IMO, unfairly. From my perspective it seems like entitlement the other way around from your view. Our use of the field constitutes 1% of the hours in a given week. You can slice the hours any way you see it. You could say daylight hours only (ignoring the fact that they do have lights at the field), but permitting fields is standard practice in the city. As I previously mentioned, if the field is permitted at a given time, then a pick up game can be played in any other available space. Even taking your fairly aggressive numbers as gospel and a worst-case scenario, 60% of free pick-up play at this field can still happen. That’s a pretty good deal if you ask me – $7,000,000 in renovations in exchange for sharing with other groups? It is great to play with other players and cultures for sure, but one of the big draws to our group is that there is a lot of playing time. $7 is about 1 hour of work in the city at minimum wage after tax. It’s not a huge ask. Just like with any league, you are not required to play. One of my kids had a game on the new field last weekend, and I love it that the team can now play in the neighborhood instead of having to trek to the Avenues for a decent field. Based on the posted rules, Rec & Park seems to be trying to balance open field/ pick up game time with the demand for youth team practice fields. Most afternoon time slots and Fall & Spring Saturdays are now permitted to youth teams, which further limits the times available for adult pick up games. My impression was that permits were only available until late afternoon so that the evenings were open for pick up games. So why is Rec & Park allowing a for profit company to reserve the field? Overall though, the renovations are a huge improvement at our neighborhood park. I don’t know what league your kids play in but most leagues take a fee as well. This is really not any different than that. We get the guaranteed playing time without all the commitment of a weekly league game if we have other things to attend to that evening. I’m a ten-year Mission resident but not a soccer player. I read this because I’m curious about changing land use in the neighborhood, and because Loren posted a link to the article on a neighborhood blog. What I found unfortunate about the article (and most of the comments) was the almost-total focus on race and gentrification, when those issues would seem to be entirely secondary in the situation. The main questions would seem to be: (1) when is it reasonable, if ever, for Park & Rec to offer exclusive access to a public space through a permit; (2) practically speaking, do they need new sources of revenue to make ends meet; (3) is it reasonable for a business to secure the permit, and then charge citizens to make use of the space; and (4) are a greater number of players using the fields because of something SF Pickup Soccer provides which isn’t otherwise available–in other words, is the company expanding the appeal and use of the parks by doing something new? It’s odd to me that none of these questions is raised, let alone addressed, by the article. From my limited experience throwing events in SF public parks, I think I know the City’s answer to the first question. It would be very difficult, if not impossible, for groups ranging from birthday parties to soccer leagues to find any space to gather if they had to rely on venues randomly being free. It’s in the interest of the residents and the City to make a portion of park hours available for exclusive use by permit holders. Oh, right. The City requires insurance and some promise of safety at permitted events. But couldn’t people get the same thing if they joined a league? That brings me to the third question, and I don’t have an answer for that either. I know league fees are substantial, which means they aren’t a good fit for casual players. On the occasion or two when I’ve thought about joining a pick-up game, I’ll say that I would not have joined the mostly-Latino mostly-damn-good matches I saw at Mission Soccer…or Garfield…or 20th/Folsom. My Spanish is really weak, making me a poor team member, and most of the players looked better than me. The Mission is a diverse neighborhood, and it seems inevitable that even very reasonable public policy decisions will take some benefits away from a portion of our population. But that doesn’t make the story about gentrification or race. It makes it a story about whether or not the policies are striking the right balance. And unfortunately that’s not what this story is about. So Supervisor Weiner thinks pickup soccer should be free, but children should have to pay MUNI to get to school??? So does this mean that permits all for adult leagues that cost money will be revoked citywide, or just this one permit? Honestly, I don’t understand the difference between this situation and every other time I have been kicked off a field for not having a permit to use it at a particular time. I’m sorry but how is this different than renting to leagues? Will there be petitions to recover Crocker Amazon, South Sunset or Kimbell fields? The bottom line is that SF Parks and Recs is trying to balance renting the field and open play. I applaud that. Maybe they will take the revenue they get and continue to improve more areas in San Francisco. It is essential to know when and where a game takes place and don’t just leave our (too rare) playing opportunities to chance. Going to the field to find it over-crowded or empty and having no possibility to play is really frustrating, especially when you’ve walked quite a long distance and left work earlier to come. Getting organized allows players to get a quality game and a good time. Open pick up play on Mission Playground is structured so that new players get first dibs on the next game. You’ll always have a chance to play (and it’s *never* empty on weeknights). Come try it out! Also, you can show up any time and hop in the next game, so there’s no need to leave work early. All I have read from people against this game is pure complaints. and they want to keep it this way. Besides there are many other fields with more space for renting. So all of you complainers there is enough time for everybody, you just got to be good and stay ON.